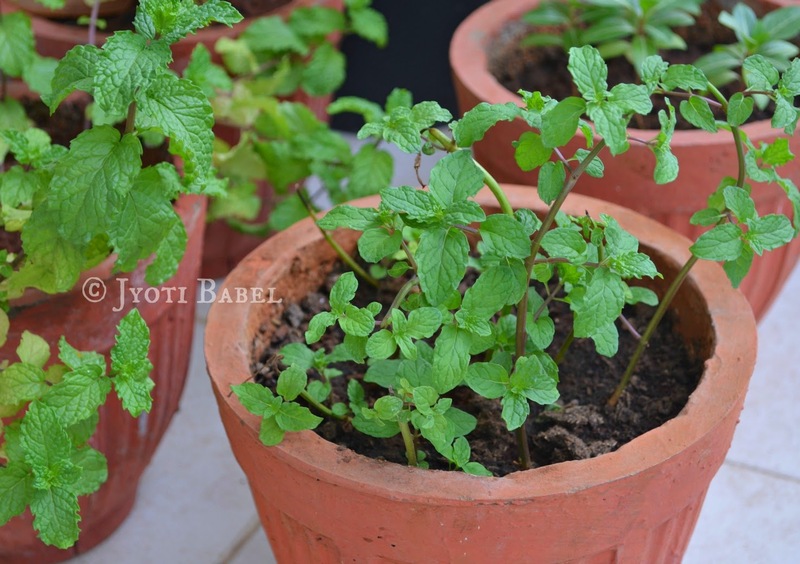 Jyoti's Pages: How to Grow Mint from Stems? How to Grow Mint from Stems? Gardening has always been one of my interests, but my circumstances have always been such that I have not been able to take it up seriously. Every time, I pass by a nursery I wish I could buy as many plants as I could. But, obviously that doesn't happen. A few months back, I was in a shopping mall where I came across a gardening counter. The person sitting in the makeshift shop was selling a variety of plants which included some veggies as well, like tomatoes, green chilies, etc. I asked him if he had mint. He told me that I need not buy it because it is very easy to grow it easily at home. All I need to do is plant the discarded stems in fertile soil and water it every day. I was intrigued and decided it to give a try. The picture you see above is about two weeks after I planted the stems. As you can see the cute green mint leaves are growing happily. I chose about 10 sturdy looking stems out of which two dried up and 8 bore leaves. So, the next time you buy mint leaves, don't discard the stems. Instead, plant them and watch fresh mint grow. While we are on the topic, did you know you can grow spring onions green at home for free? Check this post. Very interesting way to plant the mint stem, i'll try this way.